I’ll never forget right before I went out for the swim-suit competition in Miss Georgia, and I was thinking ‘oh I don’t wanna turn around and look at my rear end,’ and I remember looking in the mirror and going, ‘that is not my rear end, there’s no cellulite! I cannot believe it belonged to me!’ And it’s from the trampoline. I’m telling you, it’s from the trampoline. Simply put, your lymphatic system is your body’s trashcan. Throughout your body, lymph tissue, vessels and fluids constantly absorb and expel all manner of environmental toxins, harmful bacteria, foreign substances, dead and even cancerous cells. When your lymphatic system is weak or under performing, your body isn’t able to properly dispose of these useless or harmful substances; symptoms ranging from joint stiffness to bad breath to cancer to cellulite can appear. Performing this continuous “trash removal” process, the lymphatic system supports your body’s immune system. A bonus that experts have confirmed is, rebounding boosts your lymphatic circulation and for those who workout, that means less cellulite! To be effective, the lymphatic system fluid needs to circulate through the body – in a way similar to blood circulation. Unlike the cardiovascular system, the lymphatic system doesn’t have a pump -a heart- to promote circulation. Instead, the lymph system relies on the body as a whole to circulate fluid, using muscle contraction, gravity, and body movement as its “pump”. 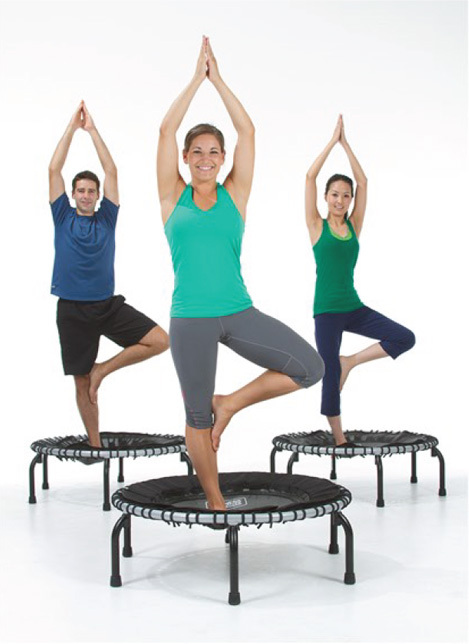 Bouncing – rebounding – on a trampoline creates the perfect synergy of these three “forces.” For this reason, rebounding is uniquely suited to stimulate the lymphatic system and help keep your body healthy. Maximizing the lymph flow throughout your body is a vital process. When you’re healthy, bouncing helps protect your physical well-being. Without enough activity to stimulate lymph flow, your body can become the breeding ground for waste that could make you sick. Rebounding for even a small amount of time each day can help your body effectively fight allergies, heart disease, chronic fatigue, high blood pressure, arthritis, headaches, and bacterial infections. Add rebounding to your day, gain the benefits that it offers, and help your body take out the trash! Check out our YouTube channel for some additional trampoline workouts!